Island nations are very aware of the threat to their culture and heritage and very lives from the perils of climate change, ocean acidification and sea level rise. Tokelau has chosen to lead by example converting their electricity to 100 per cent renewables in 2012 and now sending climate warriors to Australia to close down the largest coal port in the world for a day. While we sit and ponder the hand of climate change setting new temperature records in Australia or the most severe drought on record in California, the people of the Carribean, the Indian Ocean and Pacific small Island states suffer the effects of rising sea levels, rising ocean ocidification and increasing intensity of storms. Although Pacific Island countries only contribute 0.03% of the world's greenhouse gas emissions they will be the first to go under if the business as usual scenarios of the IPCC come to pass. The leader of tiny Tokelau in the South Pacific knows this too well. The Ulu o Tokelau, Aliki Faipule Kuresa Nasau, made this statement at the 25th South Pacific Regional Environment Programm (SPREP) Meeting in Majuro in the Marshall Islands on 3 October 2014. The meeting called for less talk and more action on climate change financing such as the Green Climate Fund. Other important themes discussed included the importance of building island resilience, developing the blue-green economy and the growing the co-operation for meaningful and durable partnerships to achieve common goals. "Climate change is already having a negative impact on all of us. This is of deep concern to us due to our fragile biodiversity and the pressure towards a more sustainable development that meet the needs of our communities. "As the region with the biggest ocean in the world we face the greatest threat not only because of our size but also due to the fact that the energy added to the climate system is stored in the ocean under the form of ocean warming. This translates to extremes of heat, rainfall and drought, sea level rise, tropical cyclone intensity and ocean acidification. A significant climate change impact on Tokelau and other small atoll communities like ours will be on reef and lagoon ecology. The increased sea surface temperatures and ocean acidification changes will have a major impact on the critical services and resources provided by the reef ecosystem which will in turn impact on food security and other livelihood factors for the communities on our islands. "Translating climate change financing from talk to action is important, as we have heard from the presentations, as it would help our small atolls and islands address the livelihood issues for our people. I would like to acknowledge and commend the metropolitan powers and development partners who have contributed generously to the climate change funds and other funding instruments to address this important phenomenon. "The leaders of the region have conveyed on several occasions the sentiments of frustration in exploring how to access climate change fund in the face of an already threatening environment, acknowledged through undeniable evidence. The current challenges around conditions to access the fund is non-responsive to the urgency that the world and this region have 'marshalled' to address this issue. "We are small islands - big oceans! We have the world's largest ocean that joins us. Through that context we can draw an opportunity for a stronger region and voice through our collective partnership. The 3rd SIDS Conference in Samoa last month, showed what we can achieve together and I acknowledge the Government of Samoa for their role and leadership and others that helped. "Today, through that collective voice, we call on the global community and development partners to work together to urgently translate climate change fund from words to action! As a regional family we must face the challenges of climate change financing head on. This is our duty to future generations. We must not fail. Tokelau is situated in the South Pacific some 500 kilometres north of the island of Samoa, is one of those nations most threatened by rising sea levels due to warming seas and climate change. Consisting of three atolls - Atafu, Nukunonu and Fakaofo - it is called home by about 1400 people on an area of land approximately 10 km2 (3.86 square miles). In 2012 Tokelau lead by example converting from diesel power to 100 per cent renewables based upon solar PV, battery storage with some biomass generation from waste coconut oil. The conversion was done with NZ$7.5 million funding from the New Zealand Government aid and development program but it saves Tokelau NZ$900,000 a year in avoiding the cost of importation of diesel fuel. In May 2014 Tokelau's conversion to solar energy earned an Energy Award from New Zealand’s Energy Efficiency and Conservation Authority (EECA). At the awards presentation in New Zealand Tokelau's Minister of Energy, Aliki Faipule Foua Toloa, highlighted the significant of the award as a great opportunity to share the dream and aspiration of Tokelau. He acknowledged Tokelau's administrator Jonathon Kings, and the Government of New Zealand for resourcing the project and New Zealand solar company Power smart who installed the solar and battery systems. “I personally believe, it is not about winning an award but it is about sharing with you Tokelau’s dream, aspirations and vision in addressing the impact of climate change and sea level rise that is affecting Tokelau and other island nations”. “Our actions now will shape the future we want for our nation and most importantly our children. I owe this award to my elders, the women, the men and the children of the three communities of Tokelau”. The project also inspired the incorporation of sustainable and renewable energy features in the design of a new 500 gross tonne ferry for the islands by New Zealand and Tokelau. As Tokelau has no airstrip, visiting the island and importation of all goods requires a 500km transport by sea from the international seaport and airport at Apia in Samoa. Tokelau and New Zealand are embarking on incorporating energy-efficiency measures in the new ferry being built to service Tokelau. According to Samisoni Pareti in Pacific Island Business magazine the new boat will be equipped with kites to help power it, and at the same time cut fuel consumption by 20 per cent. Solar panels may also be used for cooling and refrigeration of cargo. The vessel is currently being built in Bangladesh and is expected to cost NZ$20 million and have a 60 passenger capacity. Coastal management is also being undertaken to adapt to climate change and rising seas. The Atoll of Atufa is about to get swamp mangroves introduced to help prevent erosion, provide protection from storm surges and provide coastal habitat for fish nurseries. The Secretariat of the Pacific Commission (SPC) is transplanting the mangroves from Fiji as part of the Coastal and Land Management project in partnership with Food and Agriculture Organization (FAO) and Tokelau Government. Areas for transplanting have been identified and assigned for planting according to a statement. No significant land on Tokelau is more than two metres above high water of ordinary tides. Storm surges associated with tropical cyclones and spring tides can sometimes innundate villages. In February 2005 Tropical Cyclone Percy, a category 5 storm, had a severe impact on Tokelau with storm surge innundating all three atolls. "The high surge allowed the powerful winds to send waves sweeping across the low lying atoll islands. Waves swept over from both the ocean and lagoon sides of the atolls, clashing in the middle of the islands and swamping villages" reported the UN Office for the Coordination of Humanitarian Affairs (OCHA 2005). One of the issues that affects small island states with storm surges is contamination of fresh water lenses which islanders rely upon for both drinking water and agriculture. Such contamination may last for 10 months or more requiring substantial humanitarian aid for people to survive. (Terry, J.P. 2009). "...if current projections of stronger or more persistent El Niño-like conditions in a greenhouse-enhanced world become established over the next few decades, then the atolls of Tuvalu, Tokelau, the Northern Cook Islands and French Polynesia (i.e. near to and east of the dateline) will be under greater threat from cyclone-induced overwash and subsequent short–medium term contamination of their limited freshwater resources. On individual cyclone-affected atolls, storm surge effects will therefore exacerbate concomitant pressures on fresh groundwater sustainability owing to sea level rise, overexploitation and pollution. Such effects on water resources may seriously threaten the viability of communities that currently in habit these remote islands. Tokelau understands that Australia's mining and export of coal is a primary contributor to the climate change that threatens their very existence. Four warriors from Tokelau - Avelio Tumua, Dedles Suega Isaia, Aleki Manuele and Mikaele Maiava - have joined with 26 other warriors from 12 island states to stand up to the Australian coal and gas industry. 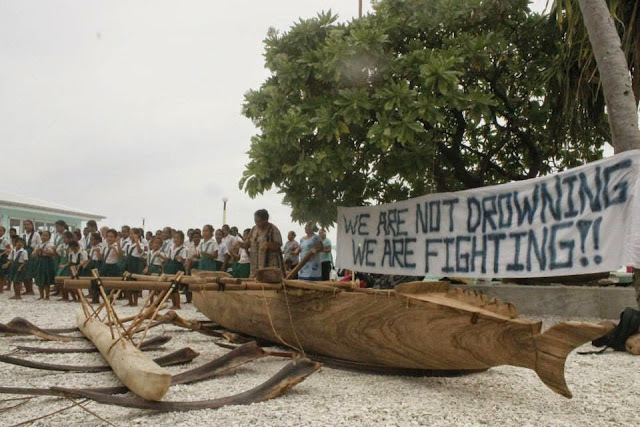 An Indiegogo campaign to Support Pacific Warriors bringing climate change to the doorstep of the fossil fuel industry closed on 30 September 2014 raising US$42,021, exceeding the $40,000 target. The Pacific climate warriors will use their traditional canoes they have built to paddle out into the harbour of the world’s largest coal port – Newcastle – to stop coal exports for a day. They will be joined by a flotilla of boats and vessels to close the coal port down. A symbolic action to communicate their message to Australia and the world. Find out more how you can support this protest at 350pacific.org or learn how you can stand with the warriors in solidarity. Watch on youtube Tokelau Warrior Dance for Climate Change Awareness at the Smithsonian taking their message to the developed nations. Will we listen?, and more to the point, will we act?, to rapidly reduce our greenhouse gas emissions and assist with climate adaptation to save the lands and cultures of our Pacific brothers and sisters?